Clarice’s Writer’s Workshop at the Hudson library on Saturday, January 20th was a good outing. We had six published authors on the panel, and about a dozen guests. Unfortunately, I forgot to take my camera, so we’re at the mercy of one guest who took one picture. She says she’ll post it on her blog, but I haven’t seen it yet. Anyway, there were good questions, cogent answers, captivating readings, and tasty snacks, too. Our guests seemed to enjoy the presentation. Clarice and I stopped for lunch at the Lobster Boat afterward. We have another outing planned for February 24th at the Hooksett, NH library. She was right, of course. CreateSpace had said they’d arrive on the twenty-second. Clarice was certain they’d show up before that. (She’s having an author event at the Hudson, NH library on the twentieth, and wants me there with her.) Looks like she’s gonna get her way. After about a million edits, re-readings, rewrites, corrections and adjustments, I’ve approved the release of the paperback edition of Premium Mixed Nuts – An Anthology for publication and distribution. CreateSpace says it should be available from Amazon in three to five business days. Did it! 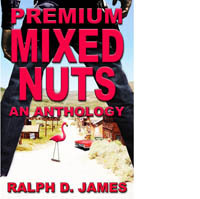 Premium Mixed Nuts – An Anthology is now available as an e-book on Amazon. And, for those who like to shop elsewhere, this Books2Read link will take you to other vendors who have it. Now I’m working on getting the paperback put together. Hopefully, that won’t be too hard. And, for something else to do, I’m reworking Pandora, too. NOLA Nights is finished. Now I’m trying to get my head around e-publishing. Amazon has an easy-peasy way, but it ties you into them exclusively. Draft2Digital lets you go through a bunch of vendors, including Amazon. More research and thought required. Draft2Digital says they also will provide a paperback-ready file that can be used for hard-copy publishing with CreateSpace and other print-on-demand venues. Sometimes I think the writing was the easy part.